I love to wash my whites and towels with bleach, but sometimes I wonder if there is a better way. Fortunately, thanks to some research, I was able to find several different alternatives to actual bleach. You don’t have to worry about chemicals while still getting your clothes clean. 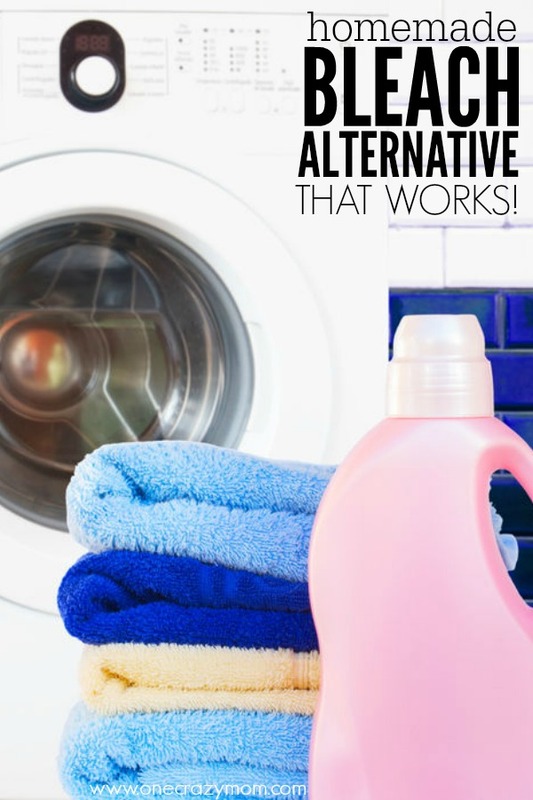 This homemade bleach alternative works great in your washing machine. I love knowing I am using products that are natural while still being effective. Plus, it really is very simple and inexpensive to make. Homemade Bleach for clothes works great. We are trying to get rid of all the chemicals in our home and this is one quick and easy way to start. It is not time consuming and can be made in just a few minutes. What can be used as a substitute for bleach? You can get the same results as regular beach without all the harsh chemicals. With just equal parts Hydrogen Peroxide and water plus lemon essential oil, you have all you need. It really is that simple! When we first started trying to incorporate more natural products in our home, I thought it might be hard or expensive. I was very pleased to quickly learn just how easy it is. While I love making all natural items, I don’t have tons of time. Between work and kid’s activities, there isn’t much time left over. 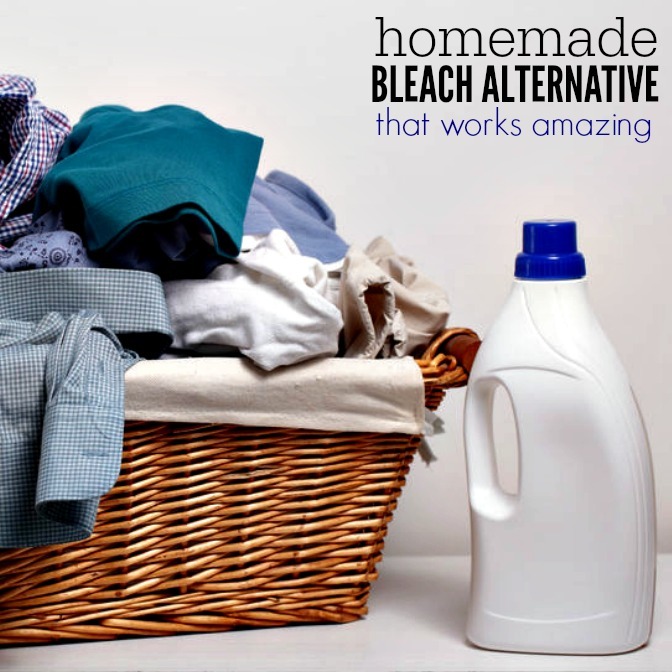 However, quick and simple projects like this Homemade Bleach Alternative make it feasible. I am very excited to share this homemade bleach cleaner with you. Besides containing safe all natural ingredients, it is VERY easy to make and frugal as well. You are going to love how easy this is. This bleach alternative laundry detergent is great. Let’s make DIY Natural Bleach! Once you see how easy it is, you will make this all the time. It is very quick. What can I use instead of bleach to disinfect? With just a few simple ingredients, you can have an all natural alternative to bleach. It’s so easy and simple. How do you make natural bleach? Add 10 drops of essential oil per 2 cups of liquid. You can adjust this to your preference.A little goes a long way, so 10 drops of essential oil is just the right amount for me. Feel free to adjust this to what you prefer. Now that you know how to make DIY Bleach, it is so easy! I use about 1/2 cup-1 cup of this homemade bleach alternative per loads of whites or towels in hot water. 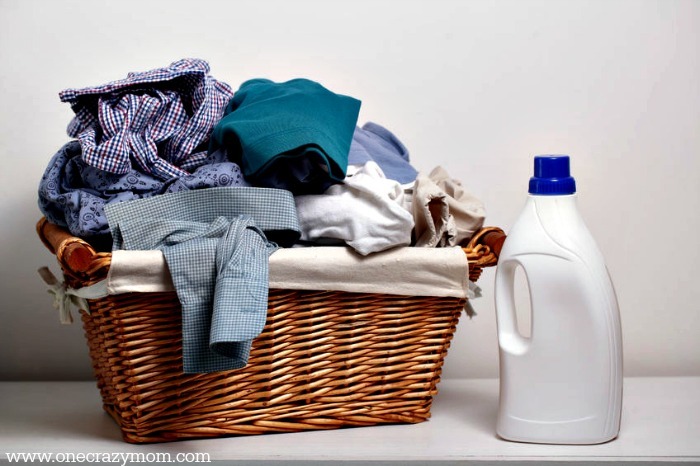 Natural bleach for clothes is a great way to avoid chemicals but still have the same outcome as regular bleach. This color safe stain remover worked great and my clothes smelled so fresh. It’s great for getting rid of odors. Some people like to use lemon juice and baking soda for stains. We also make homemade laundry detergent. You are going to love making all of these things. They work great and save money too. Plus, it just feels great to get rid of the yucky chemicals. 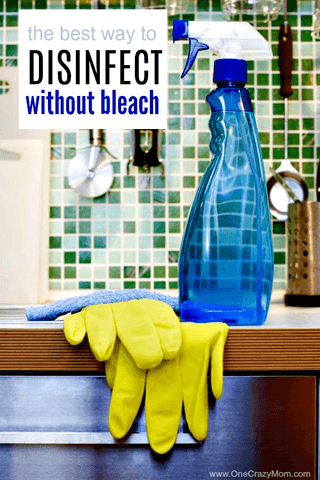 Use this bleach alternative for sanitizing. It works great as a disinfectant. This is especially useful during cold and flu season. I get a little crazy during that time of year trying to sanitize and keep everyone well. There isn’t anything like passing a sickness from person to person. And with a huge family like ours, it doesn’t take much before we are all down and out. This bleach alternative for sanitizing really helps. You could even make a batch of this and add it to a spray bottle. It is one of our favorite cleaning products and the spray bottle makes it so convenient to use. I love keeping it in a Spray Bottle for easy use. Another option is to use glass bottles. This is my preference as they hold up way better. Either way, it’s so handy and makes for easy cleaning when it’s already in a bottle. 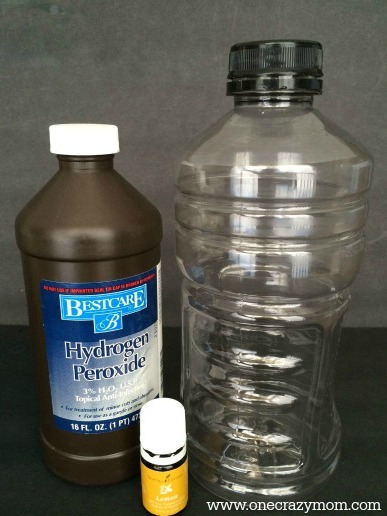 You are going to love this homemade bleach alternative because it has so many uses! It’s incredibly easy and frugal to make as well. I much prefer this natural bleach to chlorine bleach. No harsh chemicals and it still gets the job done. This Homemade bleach cleaner does an amazing job. If you have always wondered what is a natural substitute for bleach, now you know how simple it is! I bet once you make it, you will wonder why you didn’t sooner! No need to bust the budget trying to give your family all natural products to use. It’s a win all around. It is not difficult to convert to using natural products in your home. You will see just how simple and easy it is. Plus, it is all very budget friendly. 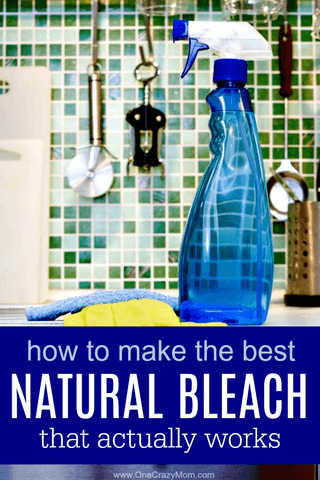 This easy Natural Bleach Alternative does the trick while being frugal, natural and simple to make.